Note: For School and college students, authorization letter is required from respective institution, also minimum 30 students are required to avail the discount entry fee for school and college students. Developed and conceptualized by Ocean Park Multi Tech Limited (OPML), Snow World has been recognized as the first snow-themed park of the country. 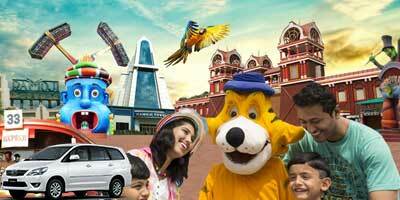 OPML has also developed the Ocean Park Theme Resort of Hyderabad. Spread across an area of 17,000 square feet, Snow World is apparently the biggest snow themed park in the world. Situated at the Lower Tank Bund Road, behind the Indira Park, Snow World is one of the interesting tourist spots of Hyderabad. 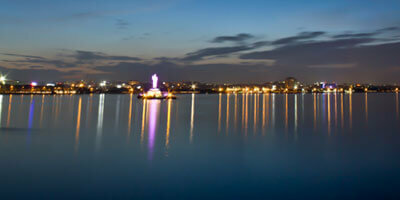 It is quite close to Hussain Sagar Lake as well. A perfect spot to beat the scorching heat of summer, Snow world has entertainment for each and everyone. There are various interesting options at the theme park to try on. Imagine throwing snow at each other without having to travel to any hill station. Snow world makes all this possible. The temperature inside the Snow World varies from 0 to 5 degree Celsius. 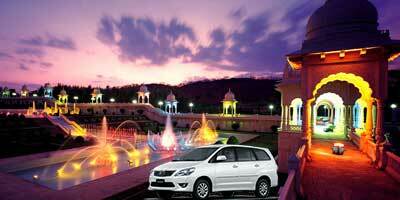 Its offer visitors with an experience of snow clad hill station with snow falling from above and amazing landscapes. Adventurous sports like trekking up the slope with many other people make your visit all the more exciting. Along with this, other activities that one can do in Snow World are ice skating, ice boarding, snow slides with bumping-car, toboggan rides, etc. Games like Snow volley Ball, Snow Merry-Go-Round, snow basket ball, Snow Dancing are quite popular. You will also find Snow sculptures and Snow Mountain here. There is also a Cryo Zone which showcases a natural snowscape consisted of igloos, alpine trees along with simulated polar bears and penguins. In the cryo zone, there is a special snow play area for children. There are many interesting rides which have the potential to turn any kid here into the happiest kid in the world! While enjoying at the Snow world Hyderabad, it is advisable to keep some safety measure in mind. For instance, as the some of the snow covered area inside might be slippery, it is better to walk slowly. Choose your rides by knowing about them completely and keep your health in mind. One snow session at snow world lasts for one hour. You are required to reach the venue half an hour before the session starting time. Snow world is open throughout the week. Its timings are from 11 am to 9 pm. Snow world ticket price is Rs. 450 for adults and Rs. 250 for Children. For college students above 10th class its is Rs. 300 while for school students of 10th class and below, the entry fee of snow world Hyderabad is Rs. 250. 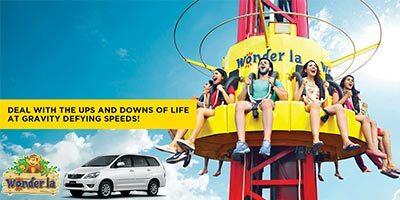 There are many packages as well such as Snow world Blue package and Snow world Double offer packages which also include both snow world and Ocean Park Hyderabad. Visitors are not allowed to take camera or mobiles inside so one cannot click any photos inside the snow world. Warm clothes, gloves and other necessary things to keep you warm are provided at the venue itself. 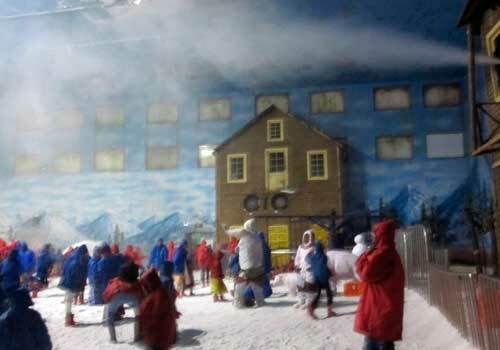 All the snow produced at the Snow world is made up of mineral water. The snow is created using state-of-the-art technology which has been supplied by Woomera Snow Guns Ltd.
We really had lots of fun at snowworld. It is worth the money they take. The ticket price for snow world is rs.450 per person and it is cheaper for kids. The amount of fun we had there, we didn’t regret spending that much. We played with snow, there were some slides too, not very big ones. Its a complete fun place. We went there recently. We took the double package as wanted to cover both Ocean park and snow world. Both the places are disappointing. Snow world might be good when it was started but now the clothes they give to wear before the snow world session looked dirty and even the entire place felt weird. Nothing great. Utterly artificial. 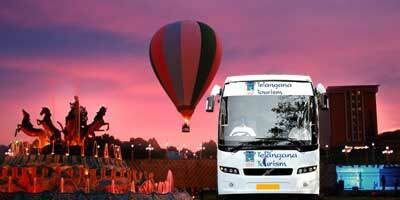 Better to save up and go see a real hill station! I went with my wife. We had a day off but nothing else to do so booked one snow world session for us. Snow world timings are from 11 am to 9 pm. We went in afternoon, post our lunch. When we entered it was chilling inside, such a contrast to the temperature outside. There is snow everywhere, its like a different world, full of snow, igloo, and nice snow games. 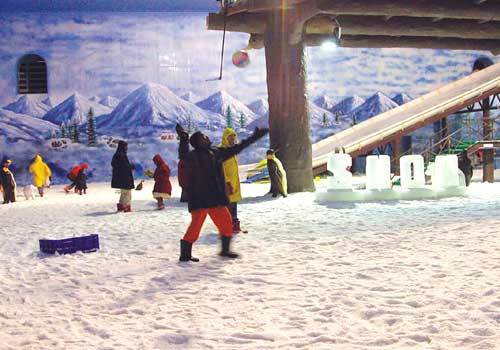 Snow world is like artificial hill station with snowfall, igloo, landscapes and snow games and rides. I didn’t find it very interesting but my kids loved it. They played with snow, threw snow at each other. There was a snow fall too which even i liked. Mobiles and all you have to deposit at the locker for rs. 10. The entry fee for adults was rs.420, for kids it was rs.250. good place for kids, they will even forget cold and just play. If they could make snow world little bigger and use quality ice and clean clothes this place would be much much better! The ice is dirty, there is no interesting game to play, slides are too short and it is crowded. And for this, snow world charge an entrance fee of Rs 450. This is a nice place to go on weekends, especially in summer. The entry fee for snow world is also not much, 450 per person; the session is for about 1 hour. When we went for the first time we thought 1 hour won’t be sufficient but its so cold inside that you cannot stay for more time. Play for sometime and then come out.